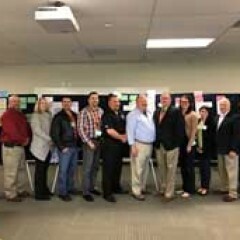 The National Institute of Corrections (NIC) and the US Department of Energy (DOE) hosted the first national workgroup on sustainability in corrections in Aurora, Colorado. April 24-28 and GreenPrisons was there. The meeting was facilitated by Stacy Fitzsimmons of SNF writing Solutions. With Stacy’s guidance the group developed the first comprehensive look at sustainability in corrections and drafted a list of specific outcomes the group would like to see accomplished in the coming months ahead. On April 26 and 27 the National Institute of Corrections (NIC) and the Department of Energy (DOE) convened a joint workgroup at the National Corrections Academy in Aurora, CO. The purpose of the workgroup was to see how both federal agencies could better serve the corrections community on matters of sustainability. Participants in the workgroup were leaders in the sustainability movement in corrections.